Since it was hard to decide where to split the post about this part of our trip in 2011, we just wright about the whole stretch (South West Australia) in one post. We drove this road in a few days, but the only reason we did so was we had little time (and the weather was bad until Cape Leeuwin). If we’d do it again, we’d take our time to explore all the bays and inlets, and there are many! 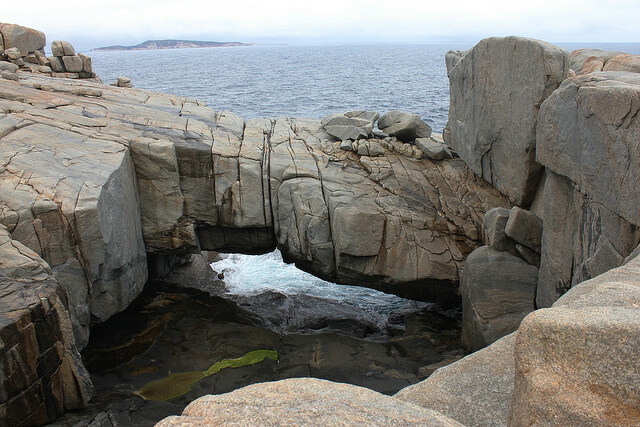 About 20 kilometres to the West we visited the first national park: Torndirrup NP, with the Gap or Natural Bridge (although London Bridge at the GOR is far more spectacular) and blowholes. The next national park is West Cape Howe NP along the way to Denmark. Just outside Denmark, we visited William Bay NP. Some sights here are the Greens Pool, a natural sea pool – safe for swimming in the ocean, the Elephant Rocks and the Elephant Cove. Elephants and oceans have nothing to do with each other, but when walking around this place, we could understand why it is called so. The cove and rocks (or boulders) are huge! We drove along the South Western Highway, and actually the landscape is very divers. Whilst you can enjoy all the beaches and beautiful views until Walpole (more or less), from there on you drive through magnificent forests and national parks. We took a deroute to the Great Forest Trees Drive in Shannon NP and had an encounter with wild pigs J For once no kangaroos jumping in front of the car hahaa. Just after this drive we left the highway and took route 10. At Northcliffe we took another detour and drove straight towards the ocean. We ended up in Windy Harbour, a small beach settlement with a very nice beach and coastline. The downside however is you have to drive the same way back (26 km one way) to Northcliffe, in order to continue your journey towards Pemberton. This region is known for the giant trees: karri trees. 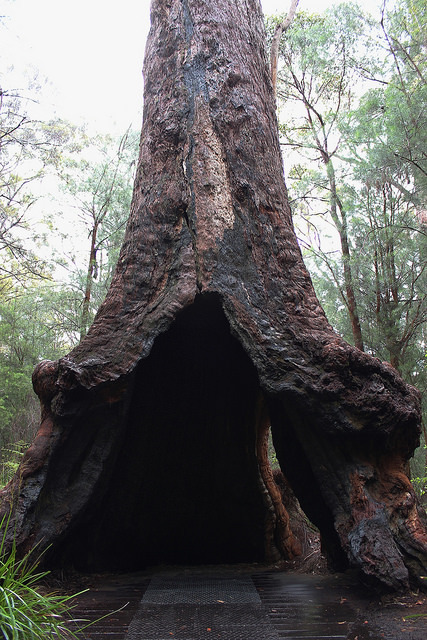 Be sure to walk and drive through the forests and be amazed by these enormous creatures (for example in Warren NP). he cape is named after the Dutch vessel which discovered this part of Australia in 1622. Matthew Flinders gave the name in 1801. Very funny to hear an Australian pronounce this Dutch word and to learn him how to pronounce it correctly is even funnier 😉 The lighthouse is well worth a visit. You have to pay to enter the grounds, and you have to pay extra to go into the lighthouse. We managed to go inside for free J Just ask it friendly, and perhaps it helped we speak Dutch, who knows 😉 From the top of the lighthouse, you not only have a magnificent view over the coastline, but you can also observe the point where the 2 oceans meet much better than at the ground. Yes, that’s wright. At this point in Australia, the Indian Ocean and the South Pacific Ocean meet each other. At different times in the year it is very obviously, due to the currents, waves and swell patterns. Driving back north, it is possible to stop every 5 km, literally. Good stops are Hamelin Bay (where we spotted a stingray), the surf beaches and Canal Rocks. Somewhere in the middle of the Leeuwin – Naturaliste Park, Margaret River is a pleasant variation on beaches, nature and beaches. Although we never get bored of these views. Spotting dolphins and whales without having to pay huge amounts, but just from the beach, is an extra plus. The northern end of the Leeuwin-Naturaliste NP is Cape Naturaliste. 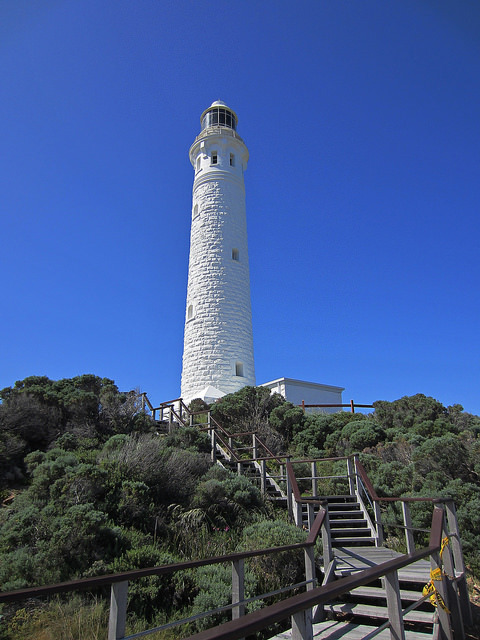 It has a lighthouse, but far less spectacular than the one at Cape Leeuwin. The walk towards the lighthouse is prettier though. Sugarloaf Rock is a popular stop as well. We spent our last night in the Margaret River region at Busselton, where we caught a very beautiful sunset. One of our last stops before heading back to Perth (or rather Fremantle) was Bunburry. 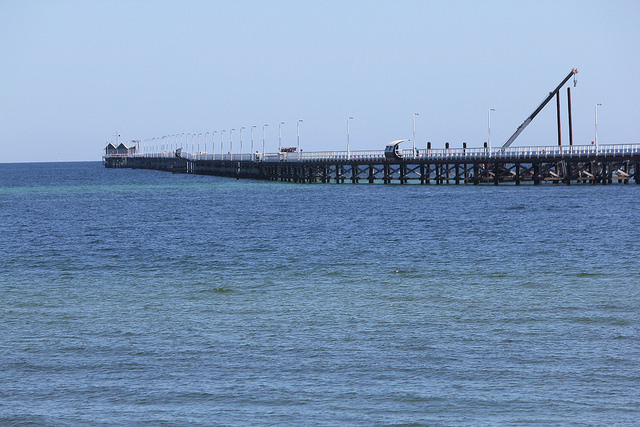 We had to see the longest jetty of the Southern Hemisphere with our on eyes 😉 The building commenced in 1865, the port of Busselton closed in 1972. This jetty was used over a 100 years to transport all sorts of goods and even had a railway … A cyclone in 1978 destroyed about 580 metres of the nearly 2 km long jetty. We drove along the Perth-Bunburry Highway, and passed / crossed Yalgorup NP and the town of Mandurah. Here and at Rockingham you can have a date with dolphins, but we think this is very unnatural and very expensive so we looked at it from a distance, only to see we were glad we didn’t do this. The last stop of this tour around WA was Fremantle, if you like some Italian food, this is the place to be! South West Australia from Travel for Motion on Vimeo.